The Werewolf witch trials were witch trials combined with werewolf trials. Belief in werewolves developed parallel to the belief in witches, in the course of the Late Middle Ages and the Early Modern period. Like the witchcraft trials as a whole, the trial of supposed werewolves emerges in what is now Switzerland (especially the Valais and Vaud) in the early 15th century and spreads throughout Europe in the 16th, peaking in the 17th and subsiding by the 18th century. The persecution of werewolves and the associated folklore is an integral part of the "witch-hunt" phenomenon, albeit a marginal one, accusations of werewolfery being involved in only a small fraction witchcraft trials. During the early period, accusations of lycanthropy (transformation into a wolf) were mixed with accusations of wolf-riding or wolf-charming. The case of Peter Stumpp (1589) led to a significant peak in both interest in and persecution of supposed werewolves, primarily in French-speaking and German-speaking Europe. Werewolf trials reached Estonia in the 17th century, and would become the most common form of witch-trial in that country. The phenomenon persisted longest in Bavaria and Austria, with persecution of wolf-charmers persisting until well after 1650, the final cases being recorded in the early 18th century in Carinthia and Styria. In Estonia, accusations of magic, which were often about enchanted potions, were rare, while the belief in magic was common. Accusations of werewolves, on the other hand, were common. 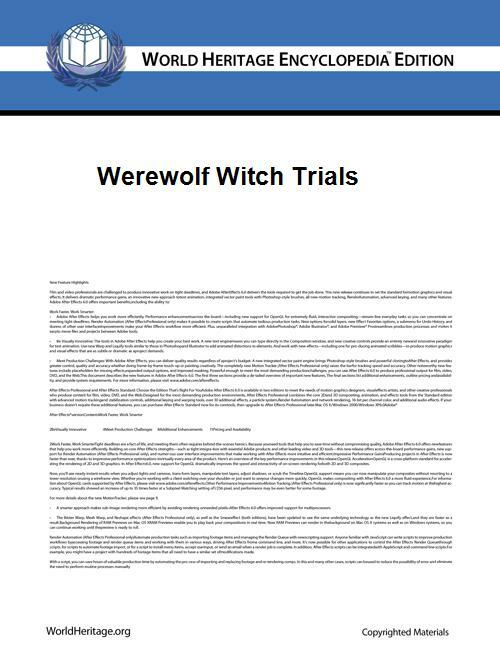 At 18 trials, 18 women and 13 men were accused of causing damage to property and cattle while in the shape of werewolves. Under torture, they confessed to having hidden their wolvf-skins under a rock. The werewolf trials petered out at the end of the 17th century. As late as 1696, however, a pack of werewolves was believed to run wild in Vastemoisa under their leader Libbe Matz. The werewolf was not always regarded as evil in the Baltic. A notable case in Jürgensburg in Livonia in 1692, follows a similar pattern, but did not end in a death sentence: the eighty-year-old Thiess confessed to be a werewolf who, with other werewolves, regularly went to hell three times a year to fight the witches and wizards of Satan to ensure a good harvest. This case is was also noted by Carlo Ginzburg as similar to that of the Benandanti. The court tried to make Theiss confess that he had made a pact with the devil and that the werewolf was in the service of Satan, but they did not succeed, and he was sentenced to whipping on 10 October 1692. The trial of "Hans the Werewolf" is a typical example of the combined werewolf and witch trials, which dominated witch hunts in Estonia. In 1651, Hans was brought before the court in Idavare accused of being a werewolf at the age of eighteen. He had confessed that he had hunted as a werewolf for two years. He claimed he had gotten the body of a wolf by a man in black. “When asked by the judges if his body took part in the hunt, or if only his soul was transmuted, Hans confirmed that he had found a dog’s teeth-marks on his own leg, which he had received while a werewolf. Further asked whether he felt himself to be a man or a beast while transmuted, he said that he felt himself to be beast”. Thereby, the court considered it proof that he had not dressed out, but really transformed into a werewolf, which meant he had undergone a magical transformation. Furthermore, as he was given this disguise by a "man in black," which the court thought was obviously Satan, he could be judged guilty of witchcraft and sentenced to death. In the Baltic countries, this was a common method of turning a werewolf trial into a witch trial. Elmar M. Lorey, Heinrich der Werwolf: Eine Geschichte aus der Zeit der Hexenprozesse mit Dokumenten und Analysen. Anabas-Verlag 1998.